People often ask us, “How can I make a difference in someone’s life?” It's easy. One way you can help, is with your generous donation. 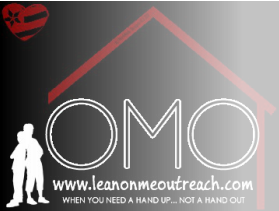 Lean On Me Outreach is a non-profit organization. We are able to continue the fight against homelessness because of people like you! With your donations we are able to help young adults avoid the trauma of being on the streets. Your donations go a long way, much farther then you could imagine. Another way you can help, is by volunteering. Our volunteers are the backbone of our cause and as we grow, with your help, we are able to help people in need. So whatever way you decide to help, just know that you are helping someone else sleep in a comfortable, affordable environment and not on the streets. For monterey donations you can call us, or click the Donate button at the top or bottom of the page. We Need Your Support; The Homeless Need Your Help!